While frustration will resolve itself, damage done to a seventy plus year old piece of history is permanent. A close up of the heat stamps. The liner band is size 57 and is date stamped 1938. Khaki Straps, one break as shown. Early adjustment buckles were cast in brass with a distinctive raised bar in the center and finished black. The stamp can be hard to see but can identify maker and approximate year of manufacture. I have both McCord Radiator and Schlueter manufactured helmet shells. But unlike the helmet, this is much easier and does not require specialized tool, unless replacement of the suspension or repainting is needed. It clipped on to the helmet loops and incorporated a chin cup previously reserved for the parachutist helmet. Initially, these were unpainted, but were changed to blackened brass in 1944. The Luftwaffe decal is 95% or better with nice toning and age checking. The main shell producer during the war was the McCord Radiator and Manufacturing Company, with the Schlueter Manufacturing producing shells on a lesser scale. Depending on the post-war change a part may be simply changed for an original period correct piece or more drastic measures taken such as repainting to original specifications. If you are using the international shipping program keep in mind that I am not able to combine shipping because ebay does already. The paint exhibits aging that is indicative of the touch up being done decades ago. Nearly all liner manufacturers were marked by molding, stamping, or imprinting their company hallmarks into the liners they produced. The liner leather is in good overall condition with typical wear and stains. The perfect item to convert your standard American liner to a American Airborne liner! A feature later used on the British Mk. Originally, the chin straps were sewn onto fixed loops. Overall, a classic M1918 Reissue German helmet. The liner appears to be size 58 and is date stamped 1940. Liner was repainted and possibly the interior of the M-1 shell. The buckle was changed in 1943 to a clamp with a more pronounced lip to ease adjustment of the buckles clamp. The National Colors decal was on the helmet when issued but was removed as per the 1940 regulations. In 1943, the green-painted A-washers replaced the earlier unpainted washers during the manufacturing process. The liner band is size 56 and it is dated 1936. Shipping: I combine shipping on multiple items as long as it does not compromise a fragile item. In 1944, specifications allowed for the use of blackened brass in buckle production. These tabs were be replaced by square tabs in 1965. They are made to the correct size and finish which is steel, which means they will rust if left in wet conditions - just like the originals! The sweatband in the liner adjusts to fit your head via a slide buckle like some baseball caps. The Luftwaffe decal rates at 85-90% intact with typical wear from field use. The Tricolor rates at 80% with crazing. The Party decal looks super and rates at a strong 95% with nice toning. Eventually, by 1943, both types of liners were equipped with cotton suspensions and chin strap posts for the new, replaceable chin strap. The M1931 aluminum banded liner appears to be size 55. If you have any questions about this auction please do not hesitate to ask. If you find yourself frustrated at any point just put it down and walk away. Snaps on the nape strap remained unfinished until 1944 when it was also produced in blackened brass. 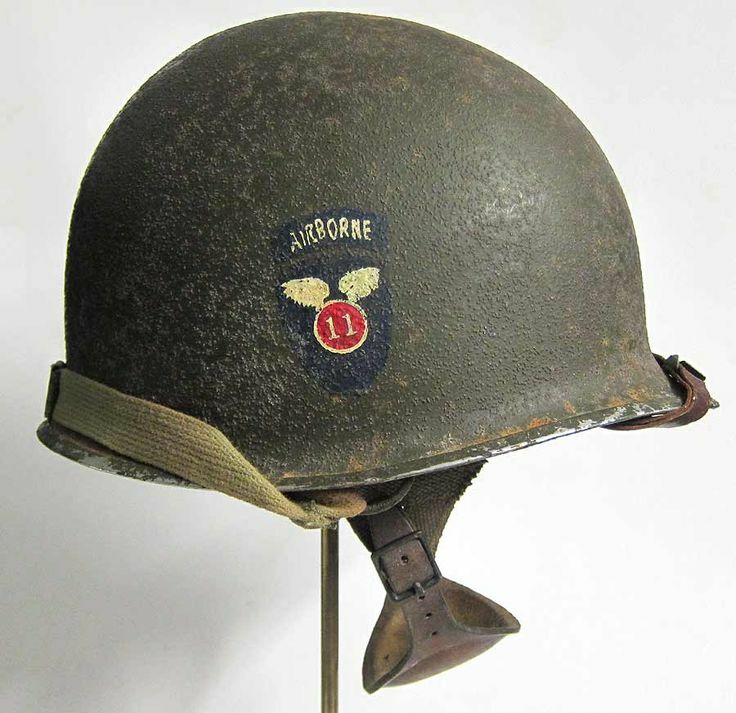 Regarded as civil defense helmets, these crude lightweight helmets were also worn on occasion by front line soldiers. The helmet retains the original civic type liner. What metal is it made from and does it join at the front or the rear? After the auctions close, please send me an email that you would like to combine shipping. The manufacturing processes tabs used were the same as the buckle. Also notice how the chamios ends at approximately the second hole - just like the originals! Due to the smaller contract Schlueter helmets are quite sought after. The helmet still has much of the original factory paint and has never been repainted. The adjusting end clip is scratched with brass showing through the paint. This headband was partially lined with leather in the forehead area. If you have a swivel bale then all you need to do to convert to a fixed bale is to grind off the swivels and spot weld the new bales. The Split pin rivets are fully intact and are original to the helmet. This made them more durable and is the reason the high- pressure liner superseded the low-pressure production method. It seems to have a cardboard-like suspension system for the head in the liner and a cloth type of strap instead of leather. The helmet has a fair amount of surface rust from poor storage in the post war years. Helmet was first owned by a soldier and then picked up by Nurse Captain. 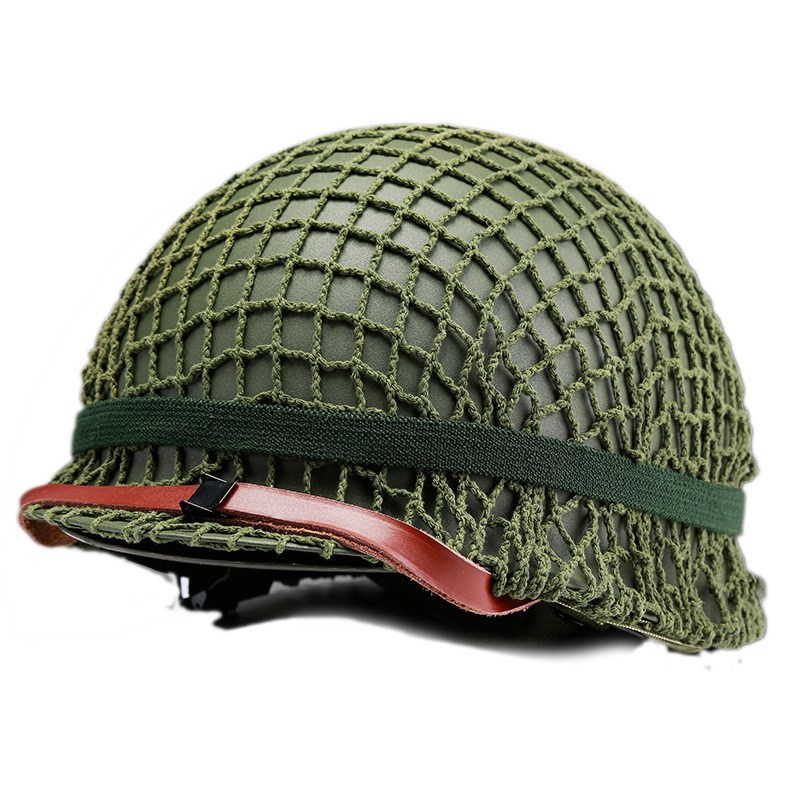 The nape strap remained virtually unchanged except it also was produced in number three shade olive drab.